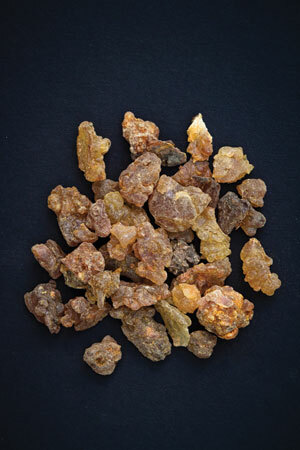 Myrrh is a gum-resin extracted from a shrubby tree belonging to the genus Commiphora myrrh (syn. Commiphora molmol). Historically this valuable plant extract was traded as perfume, incense, and as a medical remedy. The tree grows exclusively in North Africa where its origins date back to the ancient Egyptians who embalmed the bodies of Pharaohs with the antiseptic herb and also documented its first medical uses. The Indian Ayurvedic system of medicine uses a different species of myrrh (Commiphora mukul) for similar indications. For thousands of years, doctors used myrrh to treat infections. Research studies confirm the resin has antibiotic activity against many bacteria. Also, it stimulates the production of white blood cells that fight infections. Gargling myrrh tincture improves bacterial pharyngitis and tonsillitis. The classic “HEMP” formula combines Hydrastis, Echinacea, Myrrha, and Phytolacca to treat streptococcal throat infections. As a mouthwash, it helps gingivitis and aphtous ulcers. Myrrh possess antifungal activity as well. In German herbalisms, it treats oral candidiasis (thrush) that commonly affects infants. Egyptian researchers found myrrh kills protozoan parasites like giardia and trichomonas offering a possible alternative to conventional antiparasitic drugs. Its astringent, anti-inflammatory and analgesic effects help patients suffering from stomach ulcers. Preliminary studies show promise for ulcerative colitis. As a salve, myrrh treats wounds, hemorrhoids, and leg ulcers. Its vulnerary action aids the healing of ulcers and prevents and treats infections.